Spring is finally here (at least in Texas) and that means only a few more weeks of school until sweet summertime! Our little lizard friends are just as happy as we are to bask in the sun and warm up. 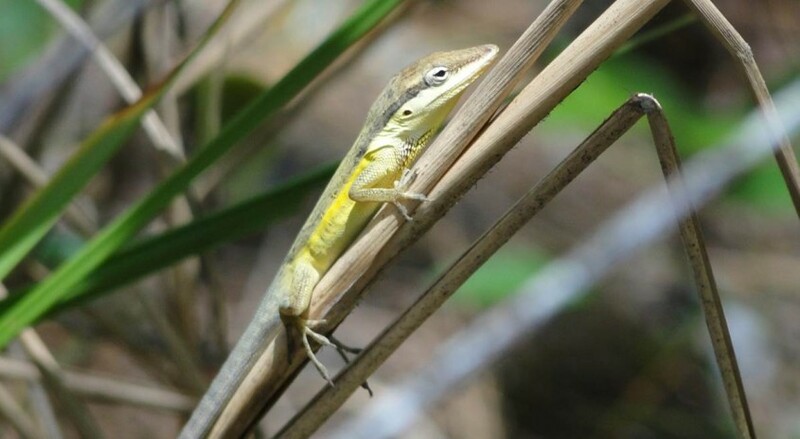 Interestingly, some species of lizards prefer the sunny weather, as well as the hot, blistering temperatures that come with it, while other species prefer to live in cooler temperatures. Have you ever wondered how your temperature might affect your brain? This is exactly what my project is attempting to determine in lizards! Lizards are a great group for studies of temperature and the brain, because lizards belong to a group we call “ectotherms.” (Sometimes ectotherms are also called “cold-blooded.”) This means that the body temperature of a lizard depends on the temperature of its habitat. A lizard that lives in a cold place will have a cold body, and a lizard that lives in a warm place will have a warm body. Humans, on the other hand, are “endotherms,” and we keep our bodies at a constant temperature (usually 98.6° F, unless we have a fever). In my study, I’m comparing the brains of lizards from Puerto Rico, where some species live in the cool, damp, shaded rainforest, and others live in the hot, dry, sunny desert. The differences in temperature between these habitats may affect the composition of the lizards’ brains. One important type of substance in your brain cells are called “lipids.” Lipids are fatty molecules, and they help brain cells communicate with each other. When the temperature changes, lipids can change too, to keep the brain cells in a fluid state. You can imagine this if you are waiting for the school bus with your friends on a cold day. Everyone will huddle together to stay warm. In the brain, more unsaturated lipids would be present so the molecules would not clump together too tightly. Or, if it is warm outside, then you and your friends will stand apart from each other to stay cool. In a “hotter” brain, having more saturated lipids would keep the cell membranes from falling apart. I predict that lizards in hotter environments will have more saturated lipids in the brain which clump together tighter. On the other hand, lizards in cooler environments will have more unsaturated lipids which stay further apart. So do hotter environments create a mushier brain? Thank goodness the answer to that question is no! Those lizards enjoying the sunshine should thank their lipids because without them, their brains would look like snowmen during the summertime – puddles of slush! Jake is from Houston, Texas, and he just graduated with a degree in Neuroscience from Trinity University. Now, he works as a technician in a lab studying how cells work, and he's applying to medical school. Jake spent his last few summers chasing lizards in Puerto Rico and Texas, and he loves to play soccer.